As typical avocados do, they became ripe overnight. What to do with overripe avocados? Make soup! Slight dark patches, while not visually pleasing, are still good. Potatoes cooked in low-sodium veggie broth sets the stage for a super creamy base infused with thyme, garlic and lime juice. Garnished with hummus made from northern beans and a raw beet puree. This soup is also extremely delicious cold. Fill a medium saucepan with 5 cups of low-sodium veggie broth, ½ tsp dried thyme, ¼ tsp garlic powder, the juice of 1 lime (2-3 Tbsp) and bring to a boil. While the broth is heating, let’s prepare the potatoes. Peel 2 medium potatoes and cut into ½” cubes. Add the cubes to the broth and boil until fork tender. About 15 minutes. After the potatoes are done boiling, time to prepare the avocados. This recipe will require at least 2 avocados, but feel free to add up to 4. Remove them from their skin and cut into 1” pieces and add to your pot. Using an immersion blender, blend until creamy and smooth. 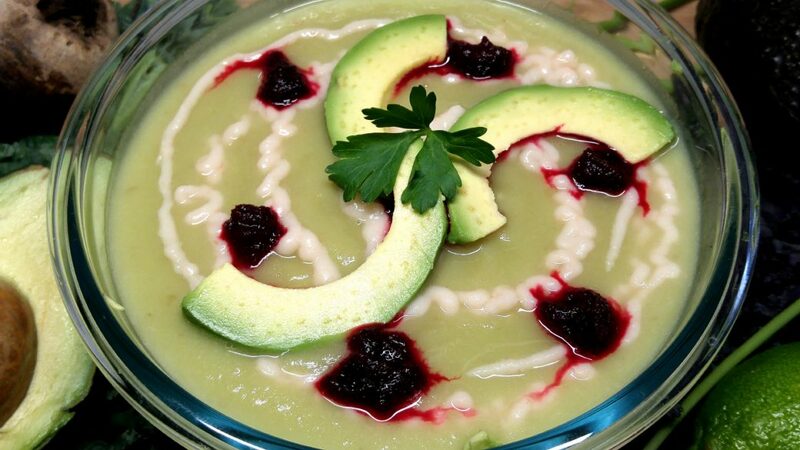 You can also let the soup cool a bit and puree in your blender. Some examples of garnishes that compliment this dish Cucumber slices, radishes, shaved carrots strips, hummus, beets, green onions, tofu creams or even fruit.